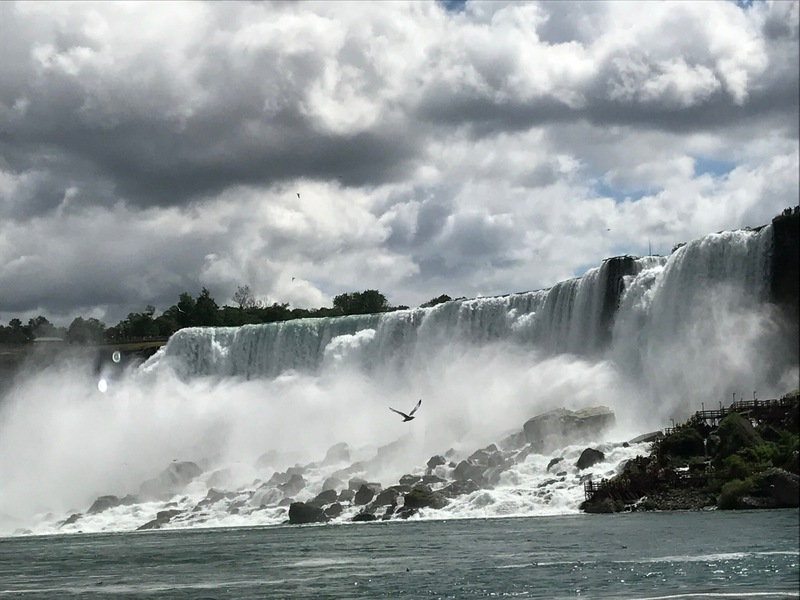 Going through the Niagara Falls area en route to Toronto, I had no idea that there’s much more to see than just the falls themselves. 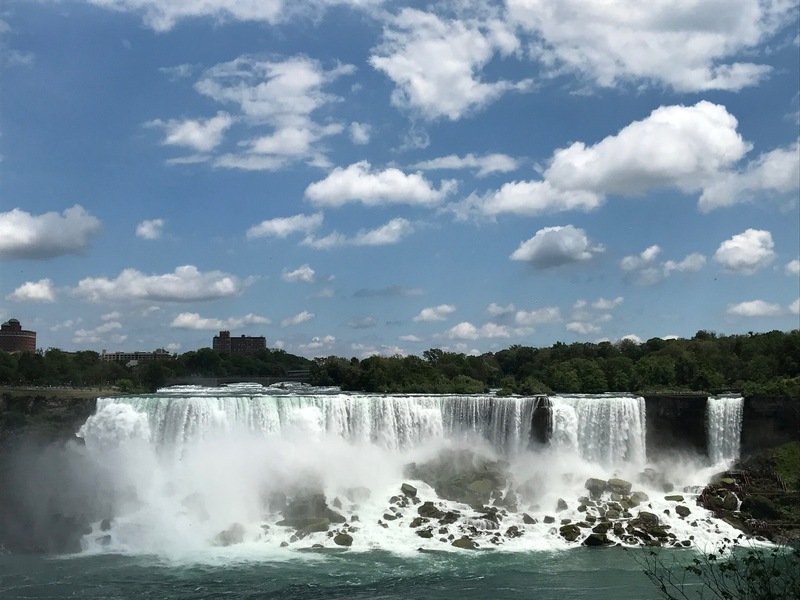 From state parks to Lake Ontario to vineyards galore, there is no shortage of natural beauty in this region. 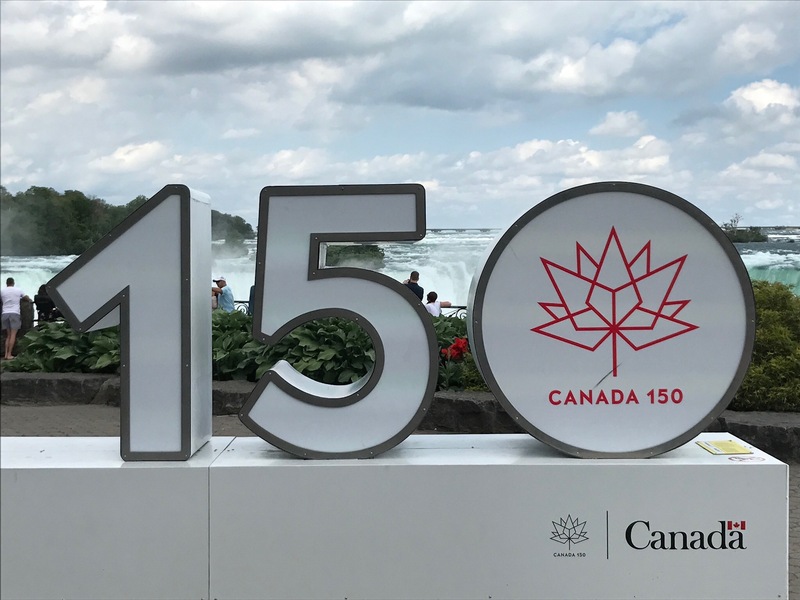 Read on to learn how to spend a few days taking in all that Niagara has to offer! 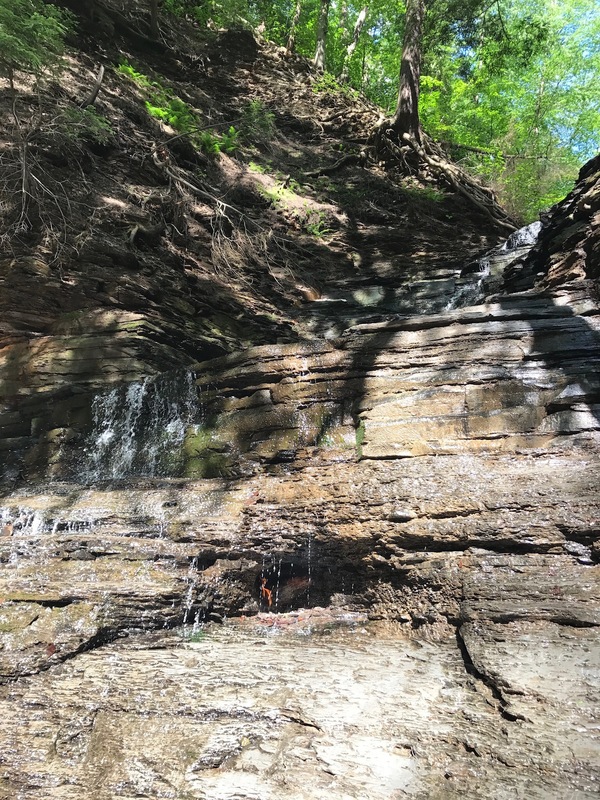 First of all, if you happen to be driving north to Niagara Falls, Eternal Flame Falls in Orchard Park, New York (about 45 minutes south of the falls) is well worth a stop. 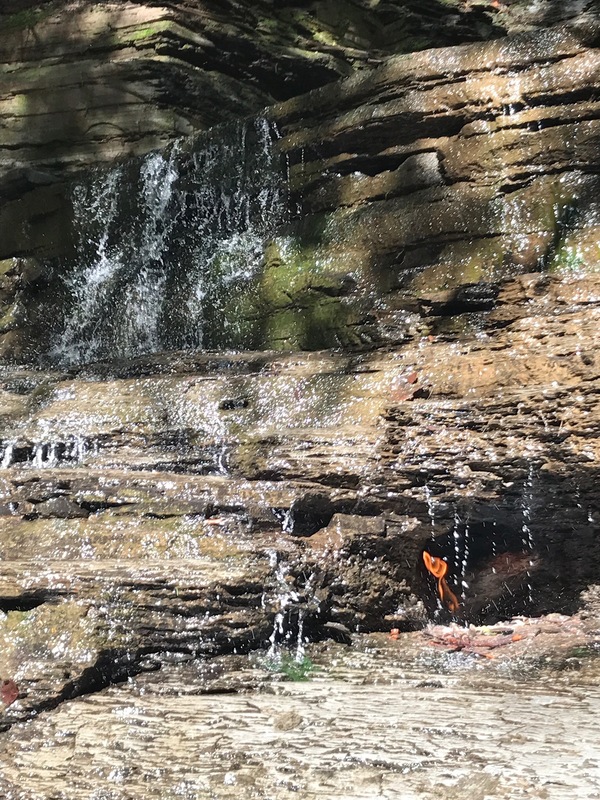 This is a beautiful, off-the-beaten path hike in Chestnut Ridge Park that culminates with a waterfall/natural gas fire combo. Yes, this waterfall actually contains a small, naturally occurring flame within one of it’s crevices. The hike to see this wonder is about 15-20 minutes each way. I would say the difficulty is moderate, with there being some slippery areas and some walking over rocks and logs. Wear some hiking-friendly shoes and you’ll be all set. A couple notes about the location: surprisingly, My iPhone directed us to the correct location with no trouble, even though we didn’t see any signs and were initially skeptical. Also, knowing which path to take is a bit confusing; look for arrows with a fire symbol. If the numbers by the fire symbol are increasing, you’re going the right direction. 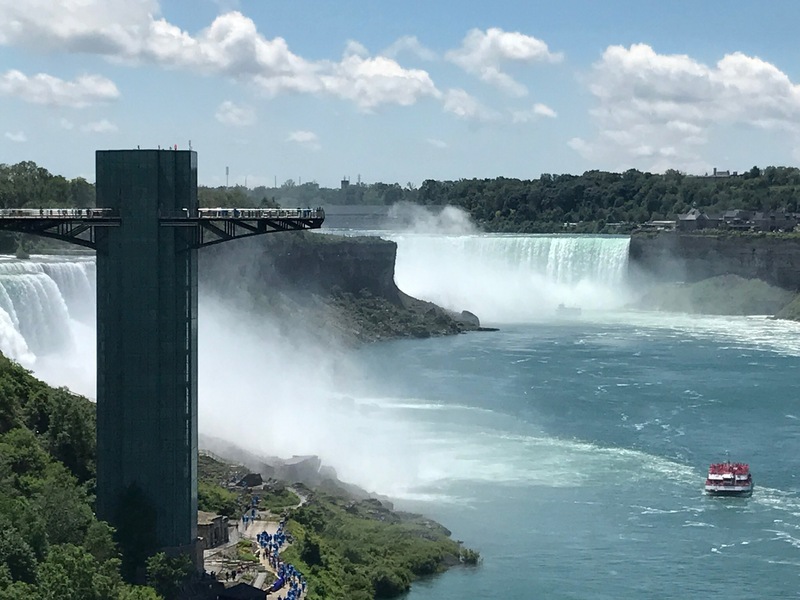 When planning your trip to Niagara Falls, one of the first things you’ll need to do is decide whether to stay on the American side or the Canadian side of the falls. 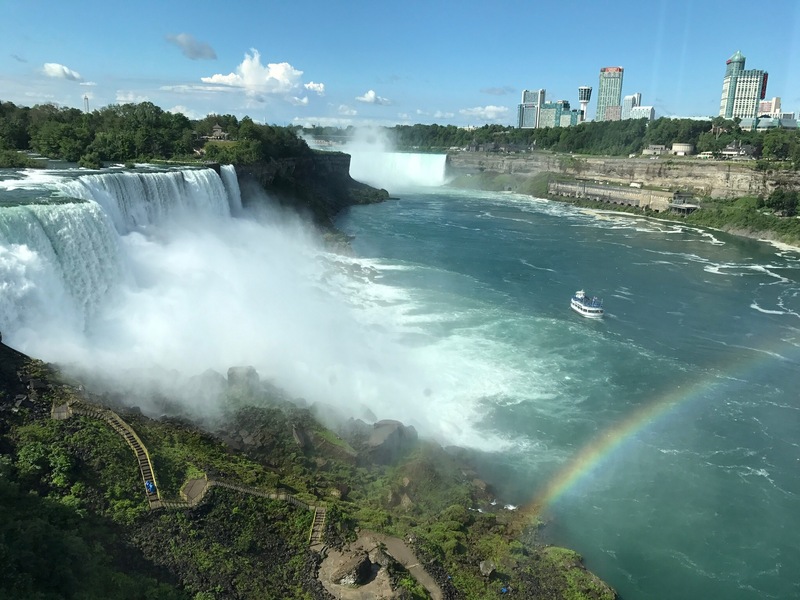 While most people say they prefer the Canadian side of the falls, as it is a bit less touristy, you may also want to consider whether there are attractions other than the falls that you want to prioritize. For example, though both sides have tons of wineries, the ones in Niagara on the Lake (in Canada) are generally considered to be of higher quality. 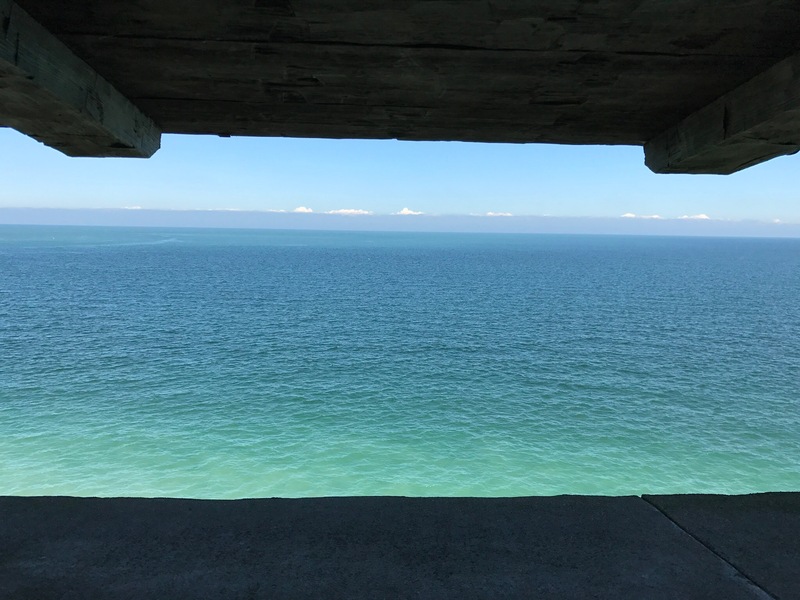 On the American side, you can visit Fort Niagara or Devil’s Hole. 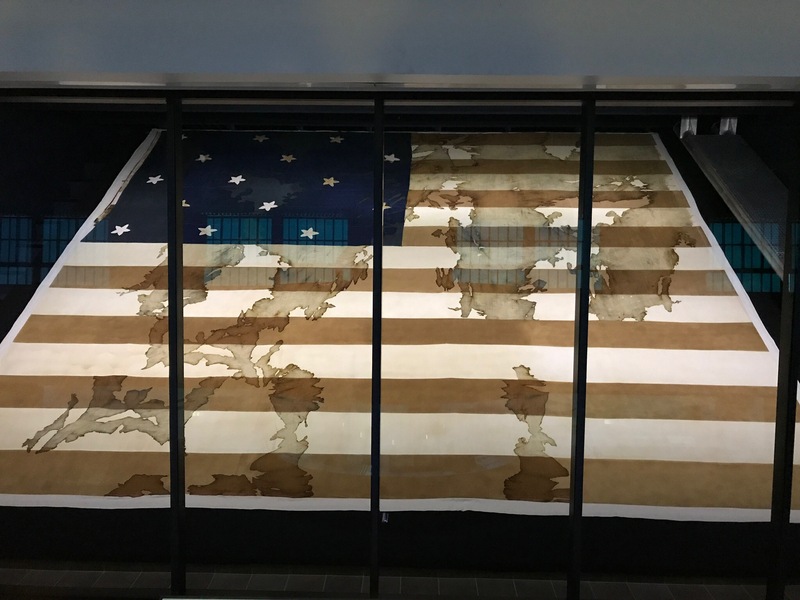 It’s not that you can’t go back and forth, of course, but it may add a little time and hassle to your trip if you choose to go through customs each day. Primarily for the convenience of our road trip schedule, we decided to camp at Four Mile Creek State Park in New York. For those who appreciate the outdoors, I highly recommend this camp site. 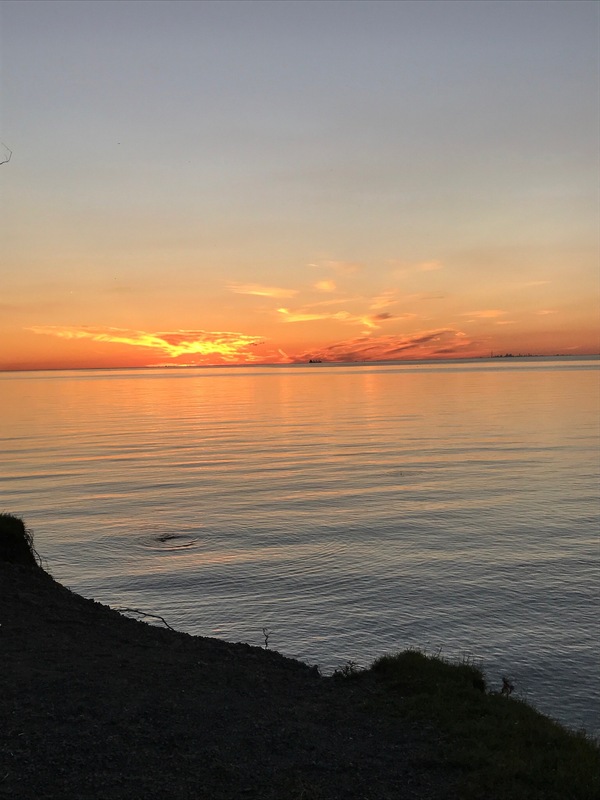 It’s about a 15 minute drive from the falls (closer than many of the alternatives) and is situated on Lake Ontario, which was perfect for watching the sunset. 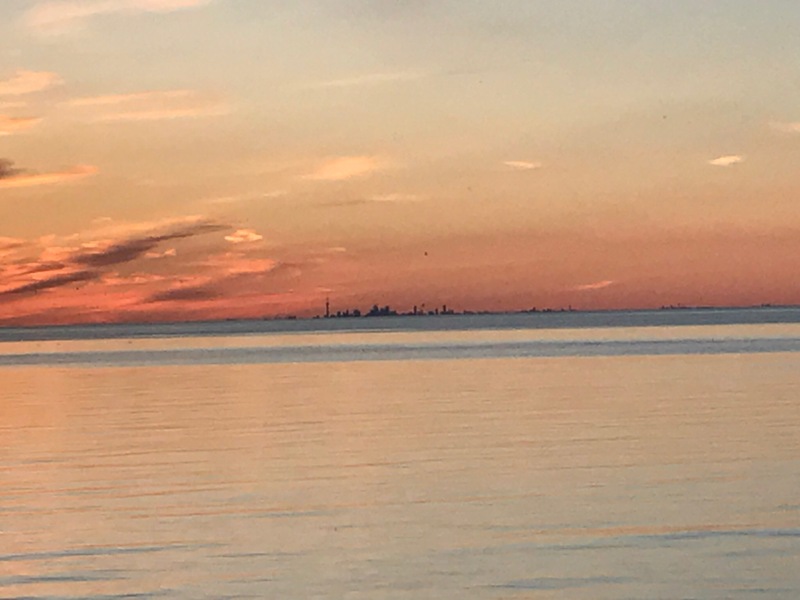 You can even see the Toronto skyline in the distance. It’s also affordable (about $25/night) and they have the basic creature comforts of hot showers, fire pits with little built-in grills, and firewood for purchase during business hours. 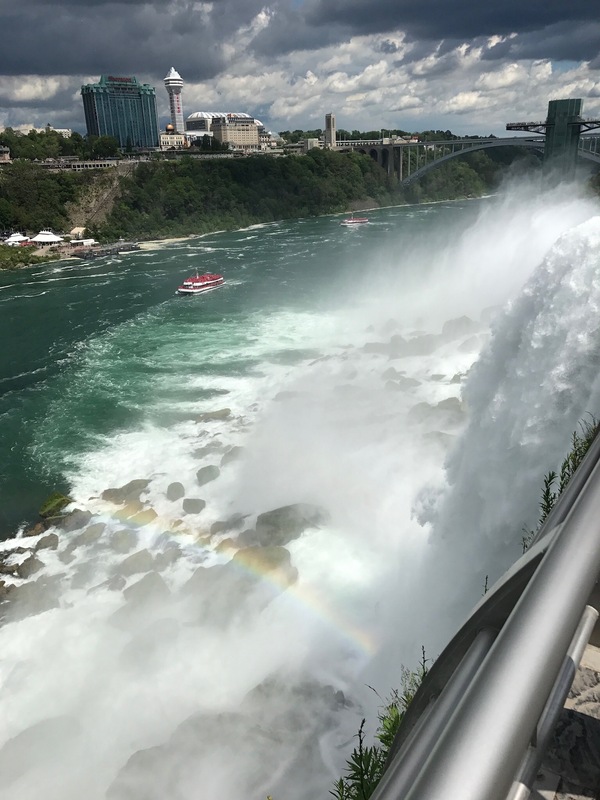 Lastly, keep your camping site parking pass handy, as staying at any state park camp site will get you a discount for parking at other state parks, including Niagara Falls. 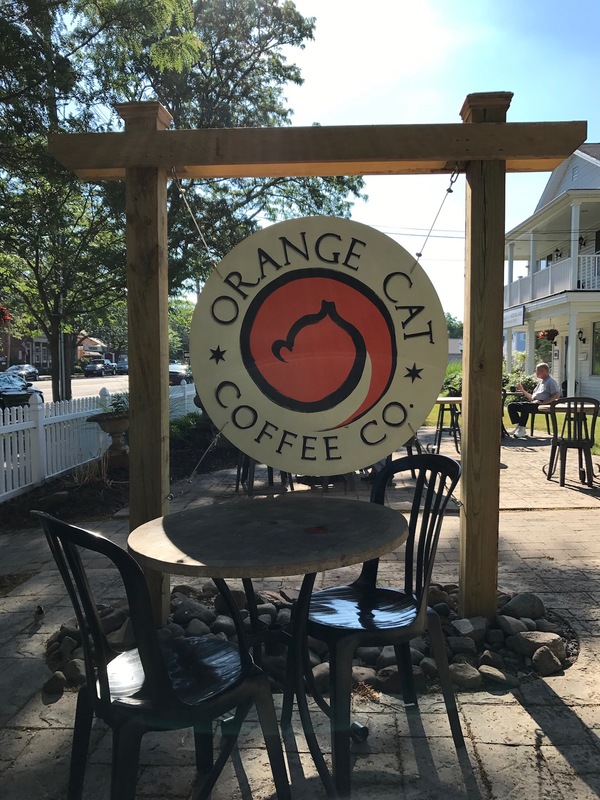 If you do end up staying at Four Mile Creek State Park or somewhere near by, make a point of stopping by Orange Cat Coffee Company in Lewiston. One of my guilty pleasures is flavored coffee so I was excited when I saw options like red velvet cake, butter cookie, and blueberry. If you go around 8 or 9 in the morning, there may be a line out the door but it moves fairly quickly. There is plenty of indoor and outdoor seating, and they boast vegan options that can be otherwise difficult to find in this area. For me, the fact that their name and logo features a cat doesn’t hurt either. 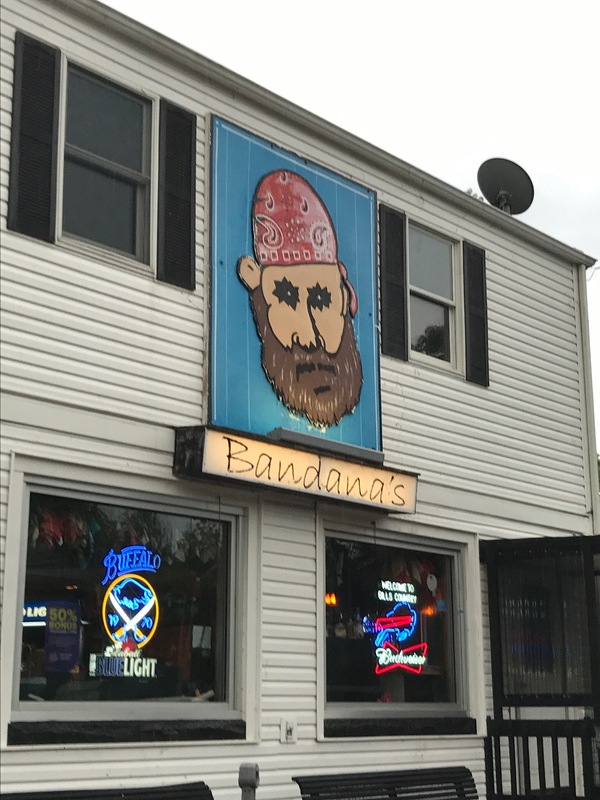 We also stumbled upon a restaurant called Bandana’s when we were escaping the rain at our camp site. I’ll admit that it was the closest place we could find and I was not particularly excited when I saw the exterior. However, the atmosphere was relaxed and cozy, I was able to get a huge vegan salad with a couple small menu accommodations, and my husband loved it. We even had leftovers that lasted us for lunch the following day. 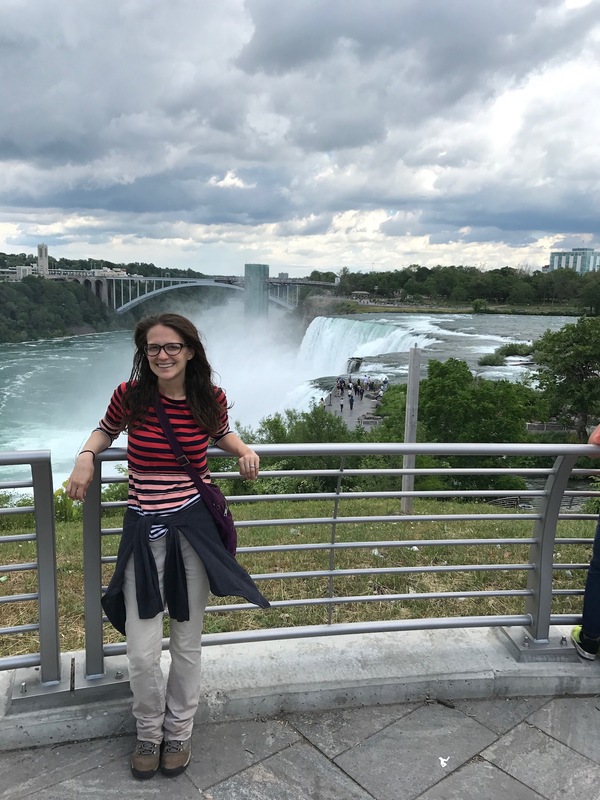 Of course, even though it’s touristy, the falls themselves are the incredible highlight of any trip to the area. 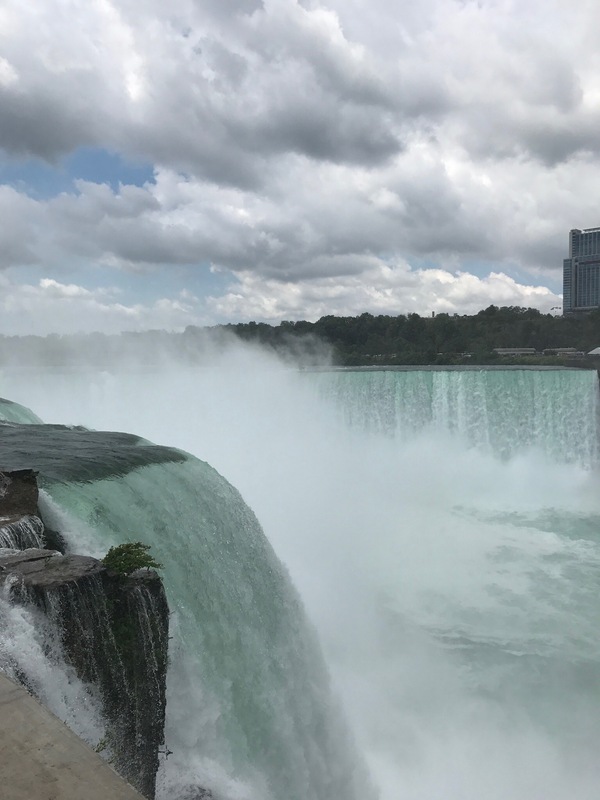 For those who have never been or need a refresher, there are technically three different falls: American Falls, Bridal Veil Falls, and Horseshoe Falls. 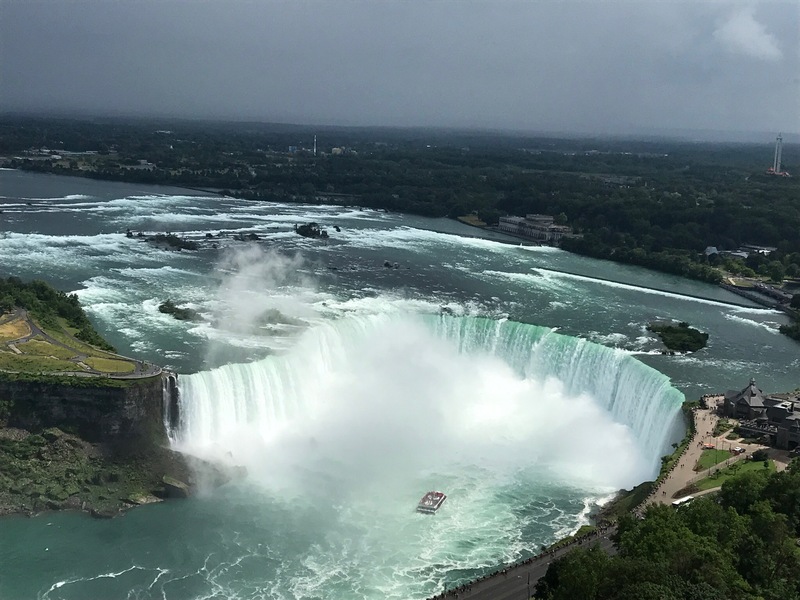 The first are both on the U.S. side, while Horseshoe Falls technically lies in both the U.S. and Canada. 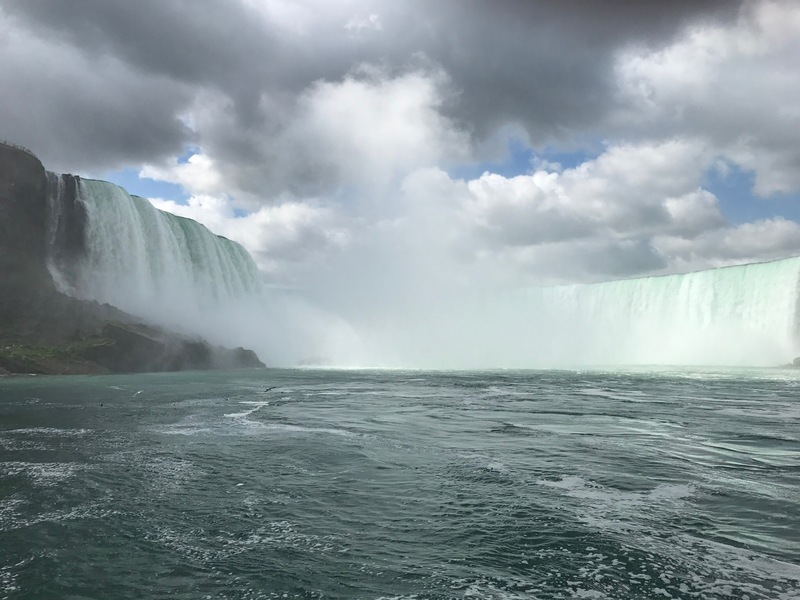 I recommend visiting both sides to get the full experience; the U.S. side has views that are more close up and personal, whereas from Canada you can get gorgeous shots of all three falls together, as well as a fuller view of the largest and most impressive Horseshoe Falls. To cross from one side to the other, simply grab your passport and walk across Rainbow Bridge. It shouldn’t take too long to get through customs on foot. My favorite part specific to the U.S. side was Goat Island and the Three Sisters Islands. 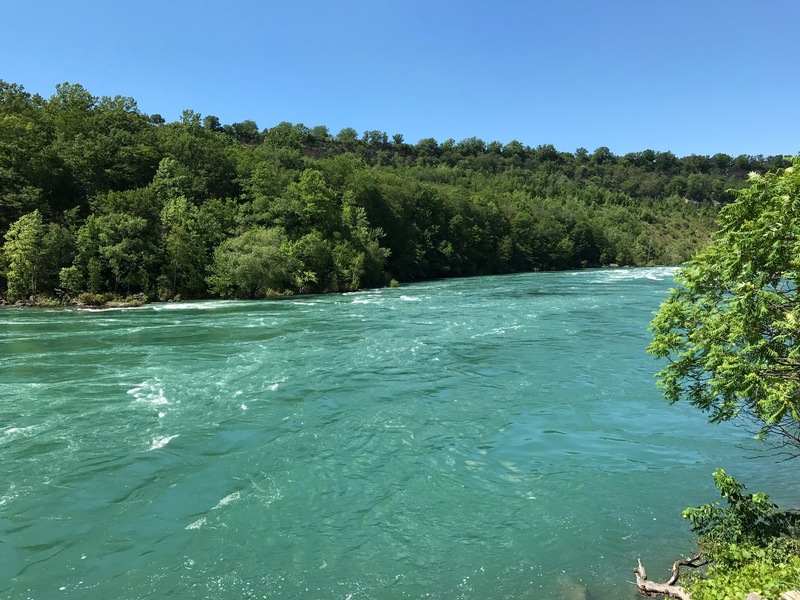 “Hiking” is perhaps too strong of a word, but Goat Island does have gorgeous trails that provide a variety of glimpses of the falls and the upper rapids. Plan for 45-60 minutes to walk the whole island, including the three sisters: Angelina, Asenath, and Celinda. These are tiny isles named after the daughters of General Parkhurst Whitney, one of the early settlers in the area who eventually became a recluse of the falls. You can walk on small bridges from one island to the next and see the crashing waters of the upper rapids before they arrive at the falls. Another of my favorite spots was Luna Island, the small piece of land between American Falls and Bridal Veil Falls. This is where I felt I got the clearest view without mist in my eyes! Don’t let the name fool you; Luna Island is just a quick stop on Goat Island that’s easy to find if you follow the designated path. 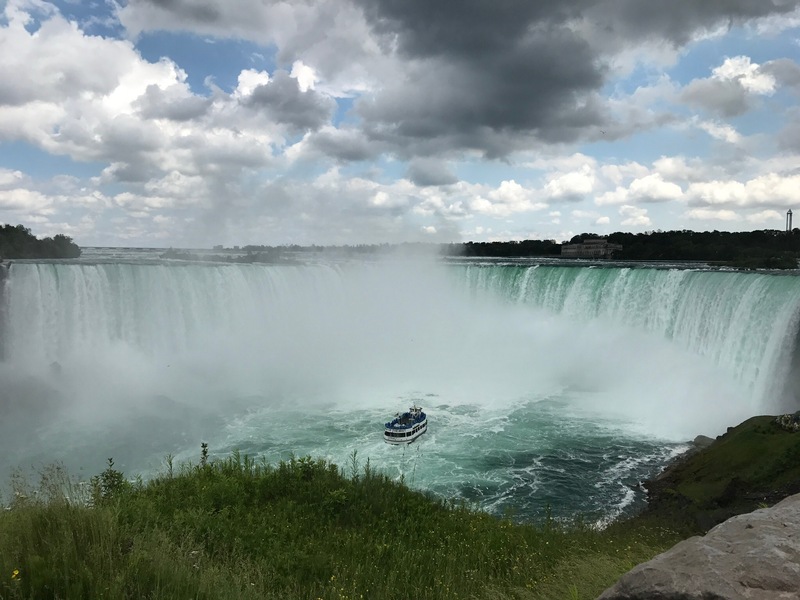 The experience I consider to be a “must” is taking a boat up near the falls. This can be done on either side (Maid of the Mist in the U.S., The Horn Blower in Canada). 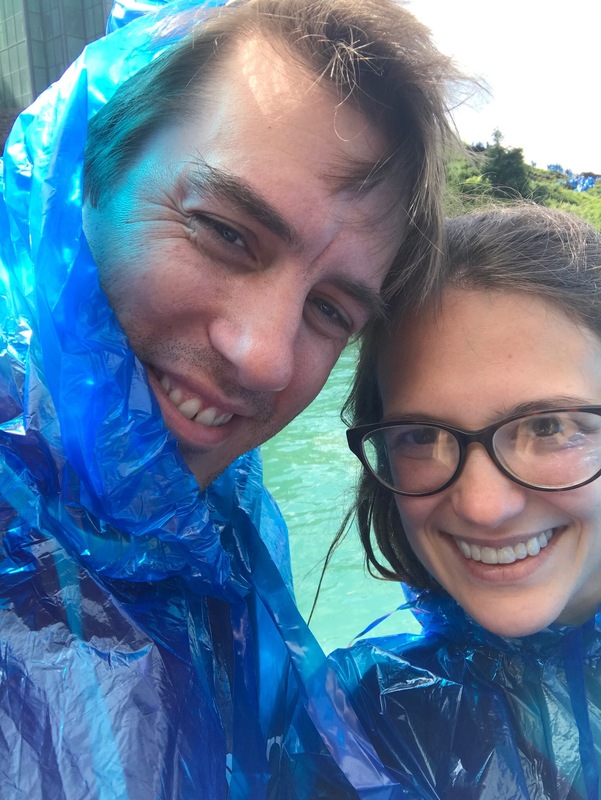 We had a blast in our ponchos on Maid of the Mist, getting unbelievably close to the falls and soaking wet. 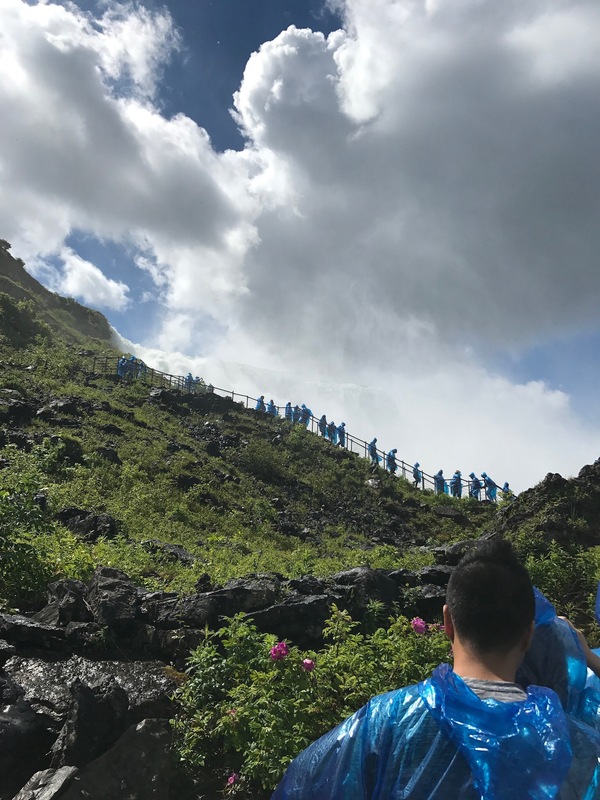 The $18.25 adult ticket also allows you to spend time on a platform hovering next to the falls and walking up a staircase by the falls afterwards. If you’re like me, you can also grab your significant other and pretend you’re Jim and Pam from The Office (think of the scene where they elope shortly before their wedding). 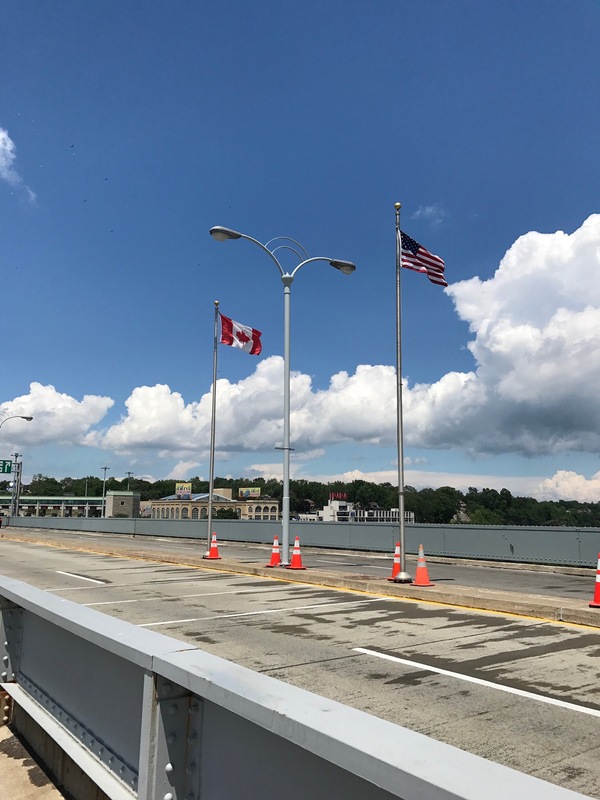 After crossing the pedestrian section of the Rainbow Bridge into Canada, we walked along the Niagara River toward the Table Rock Welcome Centre. 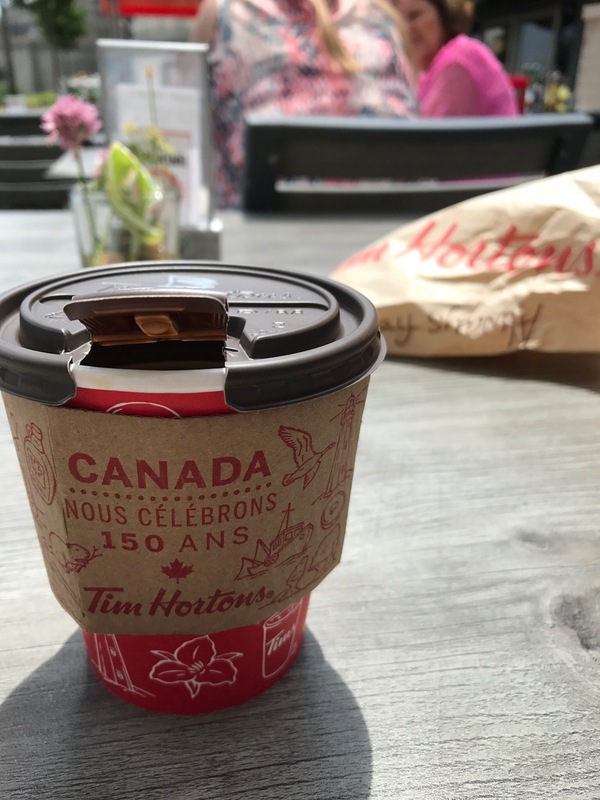 This jaunt will give you opportunities to continue marveling at the falls, grab coffee, enjoy a meal with a view, or meander in Queen Victoria Park. For adventure seekers, this is also where you can go zip lining. However, we decided to save our money and have this adventure somewhere with more lines to enjoy (there is only one short line at the falls). We elected to go up Skylon Tower instead. Tickets run about $15, or less if you grabbed one of their brochures containing a coupon, and get you a trip to the observation deck via a speedy glass elevator. This was by no means the highlight of our trip but we did enjoy seeing the picturesque Horseshoe Falls from above. 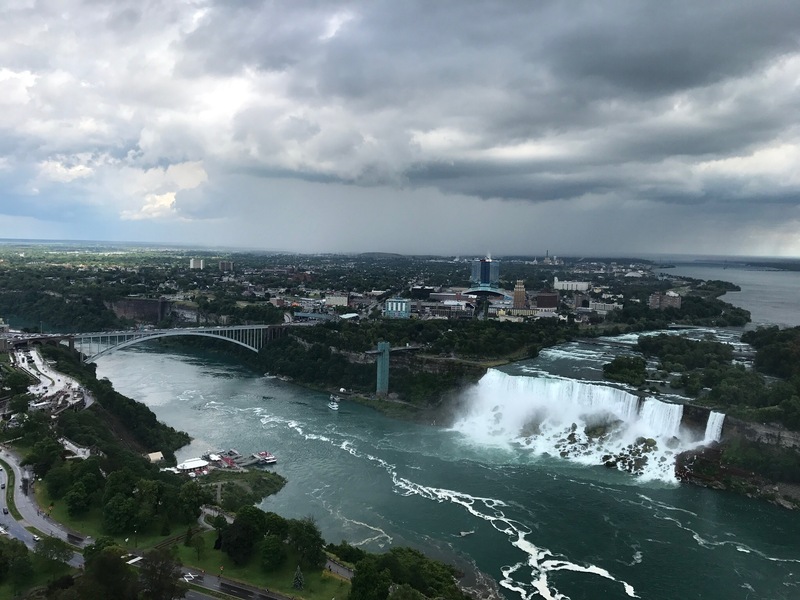 We definitely passed on having a meal at the Skylon Tower restaurant, as there is a fixed menu and high price. 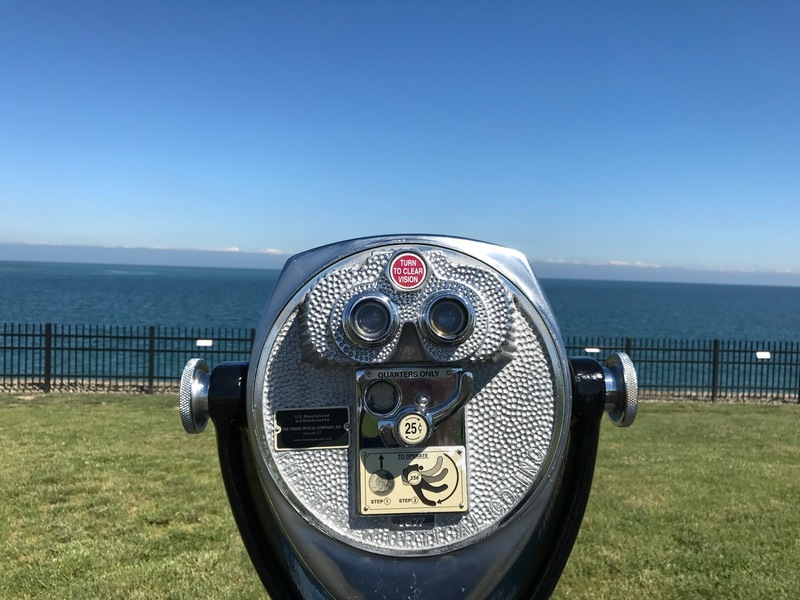 A surprising highlight of my time in the region was Fort Niagara, a historic landmark in Youngstown, New York. 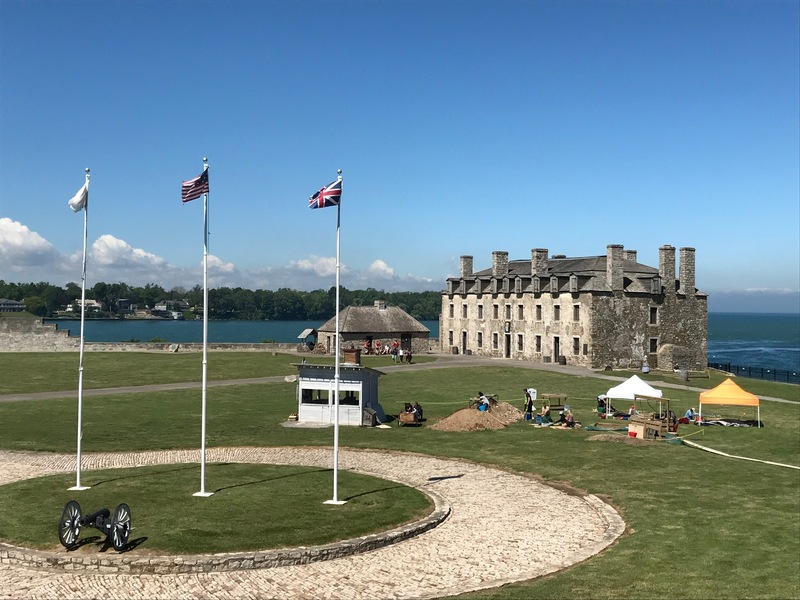 The U.S., Britain, and France each occupied Fort Niagara at different points in time, all vying for its access to the Niagara River and Great Lakes for trade purposes. 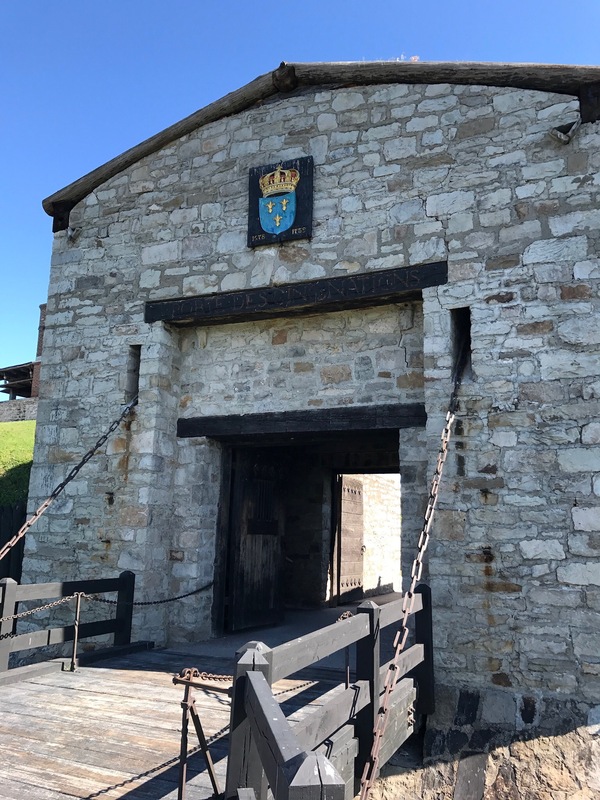 Today, you can explore the grounds, including a French castle and the 18th century buildings where soldiers slept on very uncomfortable shared beds. During the summer, there are also reenactments and demonstrations of musket shootings. 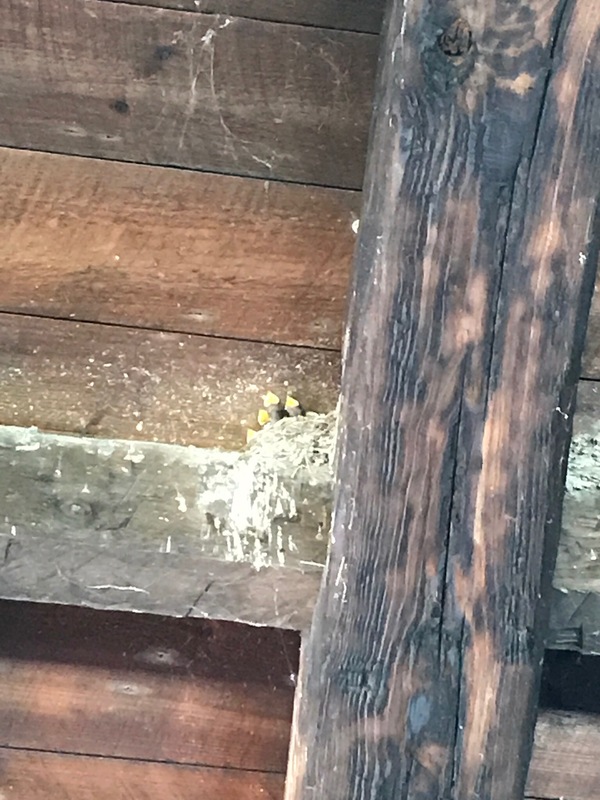 My personal favorite, though, were the nests of baby birds in the lookout towers. Devil’s Hole was another attraction that I hadn’t anticipated but thoroughly appreciated. Located at Devil’s Hole State Park, this gem of a hiking trail is about two miles long. 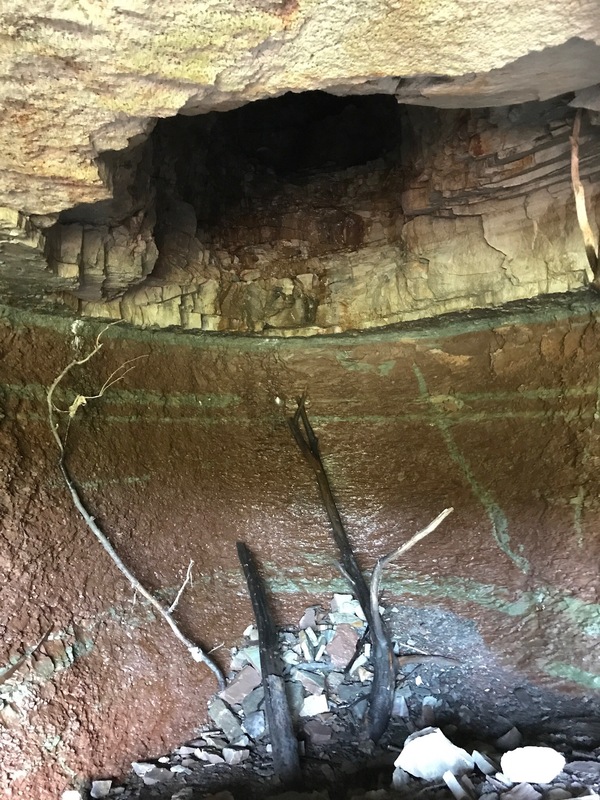 Walk down the stone staircase to find Devil’s Hole itself, which is hidden in a small cave behind a boulder along the trail. Look up to see a large black hole of nothingness. Be careful if you go this route, as there is no clear path to get behind the boulder. 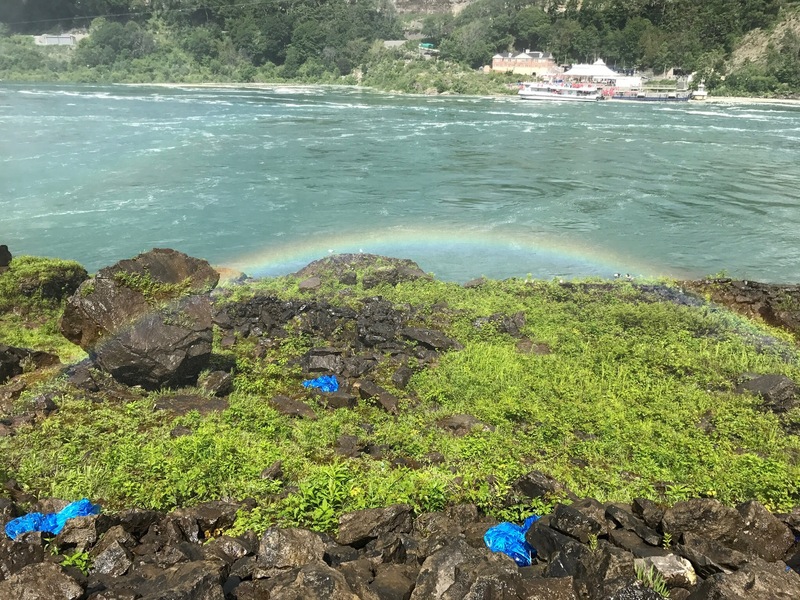 Regardless, the whirling waters of the Niagara River alone are well worth the hike. Even better, you can see the “whirlpool jets” gliding by and then doing 360° turns in the whirlpools. Take the Niagara Gorge Rim Trail back for an aerial view of the same area. 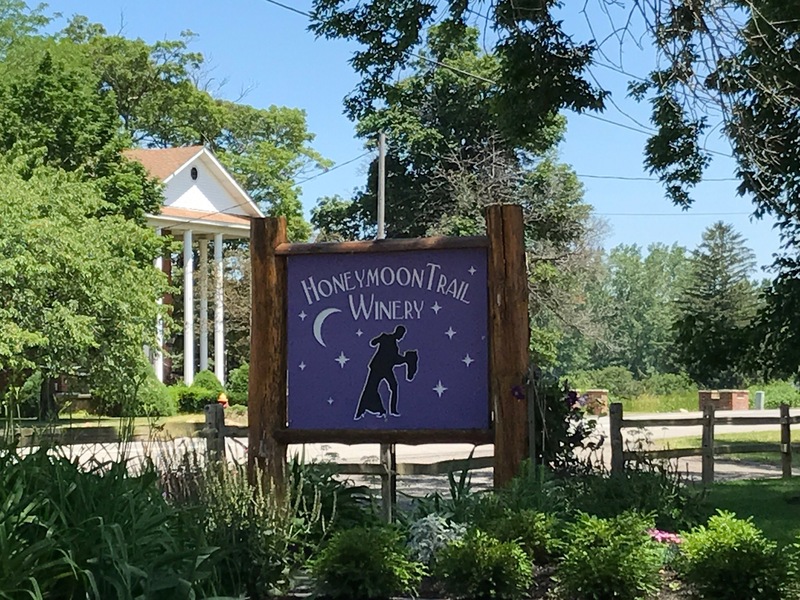 Last but not least, no trip to this area is complete without a visit to a handful of local wineries. 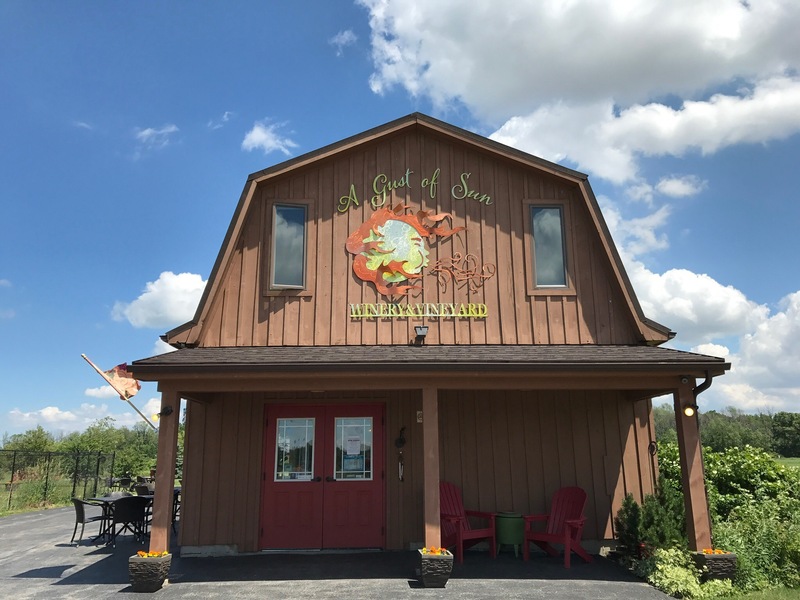 There are several wine trails within the region, with the closest being Niagara on the Lake and Niagara Wine Trail USA. With over 30 wineries in total, a connoisseur could spend a week or more touring them all. Find maps here: http://niagarawinetrail.org/map/ or http://www.wineriesofniagaraonthelake.com/visit-wine-country/maps-directions/ What bottle did I take home? The “hot” wine from Niagara Landing Wine Cellars just because it’s so unique. It starts sweet but has a spicy kick at the finish. I truly feel like I could go back to this area to explore even more state parks, wineries, and other attractions. What should I make sure to see next time? Post your recommendations below! I’ve always wanted to visit Niagara Falls! I’ll be sure to keep this post in mind when I do. I never knew about the Eternal Flame; that’s astonishing! You should definitely go! Do the boat ride for sure.